Live: Follow on BBC TV, BBC Radio and online with further coverage across Red Button, Connected TVs and BBC Sport website. Andy Murray has been seeded second in the men's singles at Wimbledon and fellow Briton Johanna Konta has been seeded 17th in the women's competition. World number two Murray, the 2013 champion, has reached the finals of the Australian and French Opens this year. 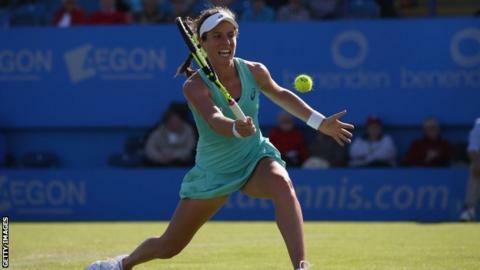 Konta has had a rapid rise to world number 18, having been 47th at the end of last season. The 25-year-old achieved her best result by reaching this year's Australian Open semi-finals. Konta, born in Sydney, Australia, is the first British female to be seeded at Wimbledon since Jo Durie in 1984. Six-time singles champion and 2015 winner Serena Williams is the top seed in the women's competition and Novak Djokovic, who is going for a third successive title, is the number one men's player. Murray, beaten by Djokovic in the two Grand Slam finals of this year so far, would not meet the Serb until the final at Wimbledon as they are in opposite sides of the draw. Swiss Stan Wawrinka moves up to fourth in the absence of the injured Rafael Nadal. Frenchman Richard Gasquet, a quarter-finalist at Queen's club this month, jumps from a world ranking of 10 to a seeding of seven as the men's seedings take into account recent grass-court form. In the men's doubles, Briton Jamie Murray and his Brazilian partner Bruno Soares, who won the 2016 Australian Open together, are seeded third. Another Briton Dominic Inglot and Canada's Daniel Nestor are seeded ninth. Murray is seeded to play either Roger Federer or Stan Wawrinka in the semi-finals, but some of the changes could make life trickier for the top four in earlier rounds. Richard Gasquet is now a potential quarter-final opponent, and Nick Kyrgios's jump from a ranking of 18 to a seeding of 15 means he is now projected to play one of the top four in the fourth round. Being one place outside the top 16 does mean Konta is seeded to face a slightly higher ranked opponent in the third round, but she would be protected from the very top seeds until at least the fourth round.